For nearly a thousand years, Yiddish was the primary, and sometimes only, language that Ashkenazi Jews spoke. Advertisement for New York performance of King Lear in Yiddish, early 1900s. Unlike most languages, which are spoken by the residents of a particular area or by members of a particular nationality, Yiddish - at the height of its usage - was spoken by millions of Jews of different nationalities all over the globe. The decimation of European Jewry during the Holocaust in the mid-twentieth century marked the end of Yiddish as a widely spoken language and of the unique culture the language generated. Today, select groups of ultra-Orthodox Jews continue to use Yiddish as their primary language. Yiddish language is now widely studied in the non-Jewish and academic worlds. Linguists have divided the evolution of Yiddish into four amorphous periods. Over the course of the greater part of a millennium, Yiddish went from a Germanic dialect to a full-fledged language that incorporated elements of Hebrew, Aramaic, Slavic languages, and Romance languages. Because no decisive dates are known that contributed to modifications in the languages, the history can be charted using general dates as turning points: 1250, 1500, and 1750. Beginning in the tenth century, Jews from France and Northern Italy began to establish large communities in Germany for the first time. Small communities had existed, and spoken German, for some time, but the new residents along the Rhine river arrived speaking a Jewish-French dialect known as Laaz. The new arrivals punctuated their German speech with expressions and words from Laaz; additionally, they probably reached into Scriptural and Rabbinic literature and incorporated idioms into their daily speech. Thus, a modified version of medieval German that included elements of Laaz, biblical and Mishnaic Hebrew, and Aramaic came to be the primary language of western European Jews. The collective isolation that came to characterize Jewish communities in the aftermath of the Crusades probably contributed to the shift from regular German to a modified, more Jewish form. In the thirteenth century, the Jews tended to migrate eastward to escape persecution. Thus, Yiddish arrived in eastern Germany, Poland, and other eastern European territories for the first time. The exposure of Yiddish to the Slavic languages prevalent in the east changed it from a Germanic dialect to a language in its own right. Consequently, a division began to develop between the eastern Yiddish of the Jews living in Slavic lands, and the western Yiddish of the Jews who had remained in France and Germany. By the sixteenth century, eastern Europe, particularly Poland, had become the center of world Jewry. Thus, the language of the Jews increasingly incorporated elements of Slavic, and the divide between the two main dialects of Yiddish grew. It was also in this period that Yiddish became a written language in addition to a spoken one. Yiddish was, and is, written using Hebrew characters. After about 1700, western Yiddish began a slow and inevitable decline, and the eastern dialect became the more important and widely spoken one. The ebbing of the former was due in large part to the Haskalah and emancipations sweeping through western Europe, while the latter was aided by the Yiddish culture that flourished primarily in eastern Europe. By the mid-twentieth century, however, the Holocaust and the repression of Soviet Jews under Stalin resulted in the dramatic decline in the usage of either strain of Yiddish. The central role of Yiddish played in Jewish life, and its eventual decline, are in part attributable to important events and trends in Jewish history. For example, in the aftermath of the First Crusade in 1096, and the rampant persecution of Jews that followed, Jews increasingly isolated themselves from non-Jewish society. This isolation simultaneously facilitated and was aided by the role of Yiddish in Jewish society. The fact that the Jews had a language of their own that was not understood by outsiders made it easy to separate themselves by developing a highly centralized economic and cultural life. The common language allowed them to live in the same areas, trade amongst themselves, and maintain vast international networks among the numerous Yiddish speaking Jewish communities in Europe. At the same time, the development of Yiddish itself was affected by the new self-segregation. Without interference from non-Jews, and unaware of the linguistic trends of the secular languages, Yiddish moved off in directions of its own, while maintaining many elements of medieval German that were no longer to be found in the outside world. The decline of Yiddish in western Europe was largely a result of contemporary historical trends as well. The Haskalah, which began in the late eighteenth century and gathered steam throughout the nineteenth, promoted secular education and acculturation to the outside society. As a result, German Jews began to enter secular schools where the language of instruction was German; to work in professions that required a knowledge of secular language in order to communicate with non-Jews; and to look down on Yiddish as a product of the insular, unworldly Jewish Shtetl, a product to be disdained and discarded as soon as possible. One maskil put it this way: "Yiddish grates on our ears and distorts. This jargon is incapable in fact of expressing sublime thoughts. It is our obligation to cast off these old rags, a heritage of the dark Middle Ages. "1 This prevailing attitude also led to the resurgence of the long dormant Hebrew language, which was seen as a "purer language." Eager to escape this stereotype, the Jews were more than happy to give up the language. Of course, it should be noted that the Haskalah, and the accompanying disdain for Yiddish, existed in the east as well; many maskilim were enamored with the Russian language in particular. However, two factors ensured that Yiddish remained central to Jewish communities in the east. Firstly, the maskilim there, knowing that they were dealing with a population that was by and large less educated and worldly than their western counterparts, were more willing to maintain Yiddish, and use it as a means of convincing the Jews that the other elements of the Haskalah should be adopted. Second, Yiddish culture was so rich in the east that the language had fewer detractors, and was seen as being more central to Jewish identity, than it was in the west. Beginning in the nineteenth century, Yiddish became more than merely a language of utility, used in everyday speech and writing. Jews' creative energy, which had no outlet in the surrounding society, began to be expressed through literature, poetry, drama, music, and religious and cultural scholarship. For the first time, the language became a means of expressing and describing the vibrant internal life that had developed in the ghettos and Shtetls of eastern Europe. Yiddish, and to a lesser extent, Hebrew, were the media of choice for this fledgling culture. Other important Yiddish authors of the nineteenth century included Shalom Aleichem, and Isaac Leib Peretz. Today, they are considered important literary figures by non-Jewish and Jewish critics alike. 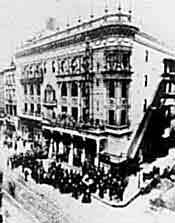 Yiddish drama was another important new development in this era. Numerous drama troupes traveled throughout Russia and Poland, performing in big cities and tiny Shtetls to universal accolades. Their performances ranged from popular plays translated into Yiddish (ironically, works as decidedly non-Jewish as The Merchant of Venice were translated and performed), to specifically Jewish pieces written and performed only in Yiddish. The Yiddish press was perhaps the most widespread manifestation of the language's prominence in this period. Yiddish periodicals ranged from the daily newspaper The Forward to various scholarly journals, which dealt with political, religious, and social issues. More so than literature or drama, Yiddish journalism also spread to locations outside of eastern Europe, where the majority of Yiddish speakers lived. 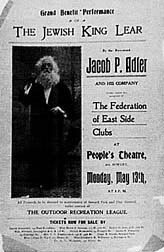 The American Jewish community in New York, for example, quickly founded their own newspapers within a short period of immigrating, several of which, most notably The Forward, are published to this day. The six million European Jews who died in the Holocaust comprised the majority of the world's Yiddish speakers. Thus in a period of six years, between 1939 and 1945, Yiddish was dealt a near mortal blow. The majority of those Jews who escaped Europe and made it to Israel or to the United States soon learned the local language and made Yiddish their secondary tongue, at best. The large number of Yiddish-speaking Jews who remained in the Soviet Union found Yiddish outlawed by Stalin during and after the Holocaust. Because of the Holocaust and these repressive Soviet measures, Yiddish came to an almost immediate standstill. The post-Holocaust generations were being taught the local vernaculars, not Yiddish. It was predicted that Yiddish would quickly become a dead tongue. Despite these obstacles, Yiddish is today enjoying a resurgence. Several populations use it as their main language: primarily the generation that lived during and immediately after the Holocaust, and the ultra-Orthodox populations living in New York and parts of Israel. But more significantly, Yiddish is today receiving attention from the non-Jewish scholarly community as a real language, and not as the "corrupted tongue" that it was considered throughout history. Many universities worldwide offer courses and even degree programs in Yiddish linguistics, and the literature of the Yiddish cultural period is receiving attention for its astute depiction of contemporary Jewish existence. Even linguists of the German language are learning Yiddish, because the development of the German language, is related to the medieval versions of it that today are manifested only in Yiddish. Sources: "Germany." Encyclopedia Judaica; Zvi Gitelman. A Century of Ambivalence: The Jews of Russian and the Soviet Union, 1881 to the Present. Indiana University Press, 2001. 1. Osip Aronowich Rabinowich [Russia  Our Native Land: Just as We Breathe Its Air We Must Speak Its Language], Razsvet, no. 16 (Odessa, 1861), pp. 200. Translated by R. Weiss. 2. David Freidlaender, Sendschreiben an seine Hochwuerdigen, Herrn Oberconsistorialrat und Probst Teller zu Berlin, von einigen Hausvaetern juedischer Religion (Berlin 1799), pp. 27. Translated by S. Weinstein. 3. In A Century of Ambivalence: The Jews of Russian and the Soviet Union, 1881 to the Present. Zvi Gitelman. Indiana University Press, 2001.